This synchronization tool gives you full control over the synchronous run of picture and sound when you edit videos on the PC. 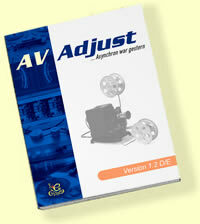 With AV Adjust you will get lip-synchronous sound in every second of your videos. Even in most difficult cases. So that your favorite actor always says what you want to hear from him! AV Adjust is intended for hobbyists and professionals who edit videos on the PC and have to solve problems regarding the correspondence of sound to picture. You have a favorite language version of a movie on audio tape that is not on the commercial release? You have cine-films dubbed long ago by means of a two-tape-method and would like to save these treasures on DVD? No idea what to do when in some movies on your video shelf the sound sometimes runs away? And - you have already experienced how almost all available video editing programs leave you alone with such problems?